African violets are easy-care plants. They boast small, purplish flowers against a backdrop of furry, green leaves. 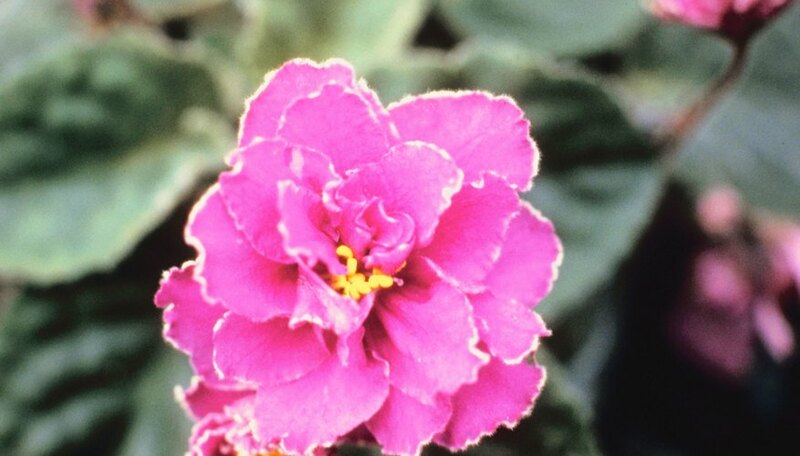 If your African violet is healthy, you will see blooms on it nearly constantly. Take proper care of the plant to ensure its long life and attractive appearance. Keep the African violet near a window or source of light. African violets need light to keep healthy and produce flowers. Make sure it gets indirect sunlight at least part of the day. Do not wet African violet leaves. A practical way to water them is to put their container or pot inside a larger pot filled about one-third of the way with water, watering from the bottom up. That way the soil soaks up the water. You can water from the top down very carefully once in a while to wash salt deposits from the soil. African violets do well in room temperatures between 65 and 90 degrees Fahrenheit. Extremely high or low temperatures can damage your violets. Feed your violets with African violet fertilizer once a month. You can buy water soluble fertilizer and add it to the water recipient surrounding your African violet pot. African violets like small pots and like to be repotted at least once a year. Use new soil and clean the roots of your violets very carefully. Preferably water African violets with rain water or water with no chemicals in it. If you are using tap water for watering let it sit for 8 hours before using so chemicals set. African violets are sensitive to chemicals in the water.